Debussy - Centenary Discoveries offers new insights into a captivating, inventive and influential musical genius. Each recording on these 3 CDs is in some way a first: Chanson des brises and Diane aux bois make their debut appearance in any form; the unfinished opera La Chute de la Maison Usher is heard just as Debussy left it; the Chansons de Charles d’Orléans appear in their original version, while Debussy’s transcriptions of his own Jeux and Khamma, and of works by Schumann, Raff and Saint-Saëns, are also new to the catalogue. Pianists Philippe Cassard and Jean-Pierre Armengaud are among the musicians who lead this fascinating voyage of discovery. 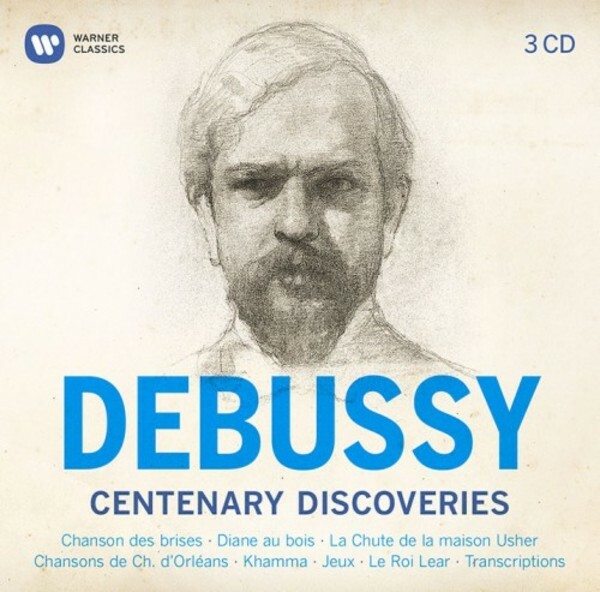 This set comprises recordings which were made especially for Warner Classics’ recently released 33-CD box Debussy - The Complete Works: the first-ever complete Debussy edition. These recordings have been made by first-class artists, such as pianists Philippe Cassard (who owns the original manuscript of Chanson des brises) and Jean-Pierre Armengaud, who has probed deep into the scores, the texts and the spirit of Debussy.